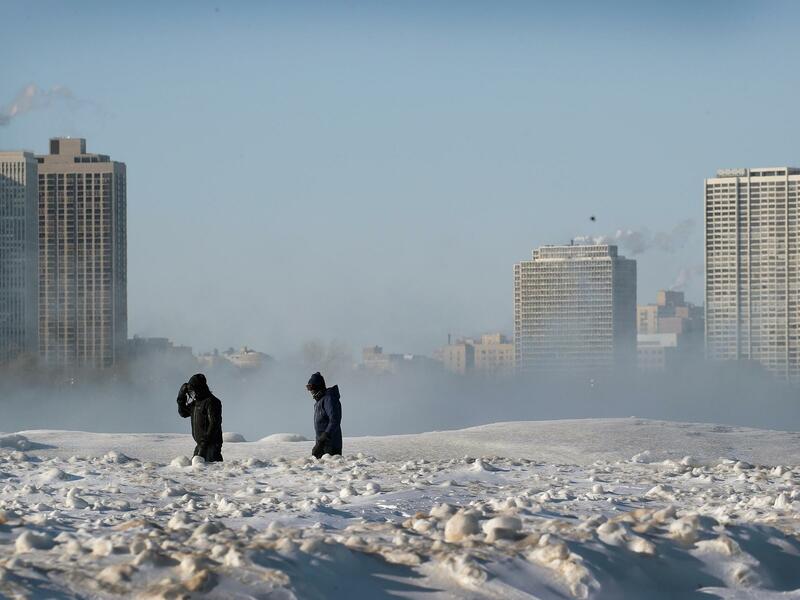 "By Friday, temperatures in the Upper Midwest will finally rebound to well above zero," the NWS says, "with high temperatures making it into the teens and low 20s. By Saturday, high temperatures will be in the 30s and even low 40s." But on Thursday, the vortex is still sitting on a broad swath of the U.S. like a massive ice cap, causing school closures, business shutdowns and other disruptions. In the Upper Midwest, wind chill values are between 50 and 20 degrees below zero on Thursday. And that's an improvement over Wednesday's even colder numbers. During the cold snap, Chicago's normally busy O'Hare International Airport has seen the most flight cancellations, with more than 700 on both Wednesday and Thursday, according to the FlightAware aviation tracking site. "Most schools are closed for a third consecutive day and homeless shelters have added extra beds," reports Matt Sepic of Minnesota Public Radio. "In Minneapolis, social service agencies have found space for everyone in need. Some families with children who couldn't get into the usual shelters were given hotel vouchers." "While an improvement, these values are still cold enough to cause problems if you are not dressed properly for the cold," the office said. Some utility companies in parts of the Upper Midwest have asked customers to turn down their thermostats to ensure that there's enough natural gas to go around. 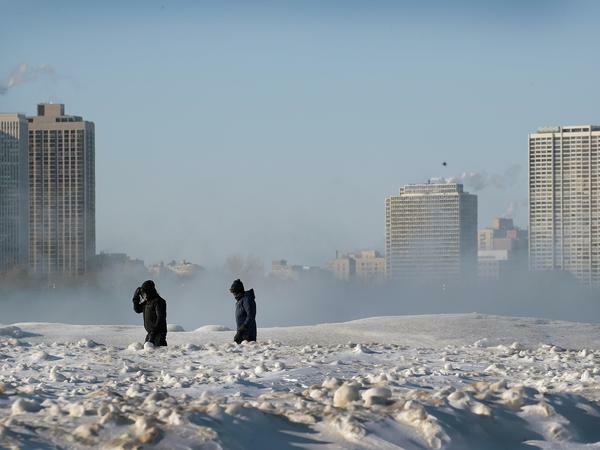 In Michigan, Consumers Energy requested that customers set the temperature at 65 degrees or lower until noon Friday. In Chicago, residents were bracing for another snowstorm, and Mayor Rahm Emanuel urged people to stay indoors. "This is not just bad weather," he said. "We look at it as a public health risk." If it is frigid where you are, take precautions to ward off frostbite. Don't go outside if you don't have to, and if you do, make sure all areas of skin are covered. Wear layers, and make sure your hands, neck and head are covered. "Even going outside for two to three to four minutes you immediately can sense that cold deep into your lungs," George Chiampas, professor of emergency medicine at Northwestern University, told NPR. "Your fingers and your face starts getting numb and painful within three to five minutes."